The DEWALT FLEXVOLT DCG414T1 4 1/2-inch - 6-inch Grinder Kit with Kickback Brake has the power to cut and grind. The Kickback Brake engages when a pinch, stall, or bind-up event is sensed and the electronic brake engages with maximum force to quickly stop the wheel, reduce the movement of the grinder, and shut the grinder off. The brushless motor is designed to deliver the run time and performance for demanding applications. The DEWALT DWE402 angle grinder features an 11 amp AC/DC 11,000 RPM motor that provides excellent power to weight/size ratio. This grinder is designed with DEWALT Dust Ejection System that increases durability by ejecting damaging dust and debris particles that enter the tool. Oversized brushes provide longer brush life. The DeWalt DCG412P2 cordless grinder is ideal for most metal cutting, finishing and polishing applications. This kit includes the DCG412 Grinder, (2) DCB205: 20-Volt Max XR premium Lithium-ion battery (5.0 Ah), fast charger, spanner wrench, type 27 (Grinding) guard, 2-Position Side Handle and contractor bag. 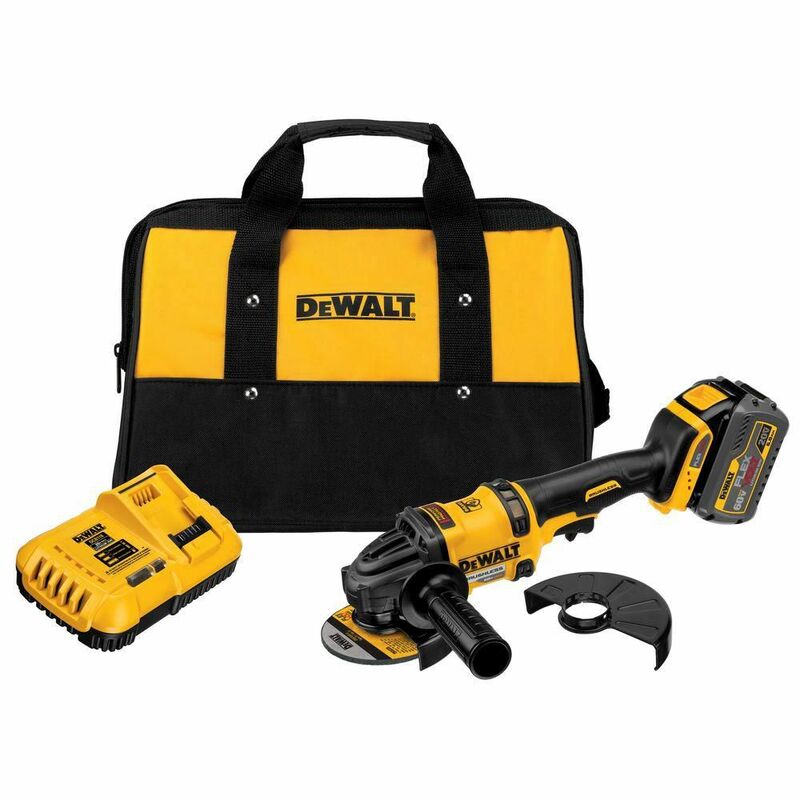 The kit is backed by a DeWalt 3 year Limited Warranty for added peace of mind. Let the sparks fly! This 5-inch angle grinder from DeWalt can do all the toughest jobs of a 7-inch grinder, while having the comfort and control of a 4 1/2-inch grinder. High power-to-weight ratio offers greater efficiency and reduced user fatigue. A keyless adjustable guard can be adjusted without the use of tools, and a rear handle design provides greater comfort and control. The grinder features a 12 amp AC/DC, 10,000 RPM motor that provides high speed for fast material removal, and sealed ball and roller bearings for extended motor life. The DW840 7-inch Medium Angle Grinder has a 13.0 amp AC/DC, 8,000 RPM motor providing high power and speed for 7-inch grinding applications. The keyless, adjustable guard provides tool-free guard adjustments convenience and ease of use. The rear handle design allows for comfort and better control. The brush caps are external for easy servicing and the sealed ball and roller bearings extended motor life. The spindle lock button allows for single-wrench bit changes. The DW840 includes grinder, grinding wheel, wrench, backing flange, clamp nut, keyless adjustable guard and 2-position side handle. FLEXVOLT 60V MAX Lithium-Ion Cordless Brushless 4 1/2-inch Angle Grinder with Battery and Charger The DEWALT FLEXVOLT DCG414T1 4 1/2-inch - 6-inch Grinder Kit with Kickback Brake has the power to cut and grind. The Kickback Brake engages when a pinch, stall, or bind-up event is sensed and the electronic brake engages with maximum force to quickly stop the wheel, reduce the movement of the grinder, and shut the grinder off. The brushless motor is designed to deliver the run time and performance for demanding applications. FLEXVOLT 60V MAX Lithium-Ion Cordless Brushless 4 1/2-inch Angle Grinder with Battery and Charger is rated 4.6 out of 5 by 108. Rated 5 out of 5 by Fuzzy from I use my tools hard they have to perform or... I use my tools hard they have to perform or else. The flex volt tools that we have replace or other tools with work great with the bigger battery’s . Rated 5 out of 5 by sheridanlawn from Has the power of corded + the mobility of moving around without dragging cords. The Battery is we... Has the power of corded + the mobility of moving around without dragging cords. The Battery is well worth the price, & after many uses it does finally run out of power but charging time is quick considering the amount of power this puts out over each charging cycle. Will be buying other Flex Volt tools.